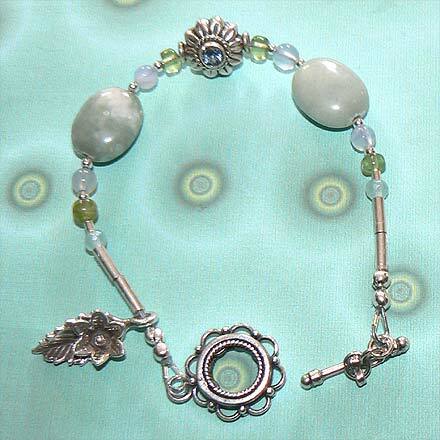 Sterling Silver Blue Calcite, Chalcedony, Blue Topaz and Peridot Bracelet. A beautiful combination of light blues and greens, and an unusual combiation of stones. For those who are interested in Astrological significances of stones, Agate (Chalcedony) corresponds with Gemini and Capricorn, Peridot corresponds with Libra and with the month of August, and Blue Topaz is the birthstone of December.